It’s March guys and yep, it’s still cold outside. Right around now is when the cabin fever hits and the kids are getting antsy for Spring Break, so you have to find things keep your littles happy and occupied. Enter my newest television obsession… any show that has tiny tots cheffing it up. Master Chef Jr., Kids Baking Championship, Chopped Jr. You name it and if they are 16 and under, I’m invested. So in the spirit of this food fascination of mine, I thought I would bring you a few places to spark the Guy Fierri in your little one. Looking for an interactive class to help your child learn how to make healthy choices in the kitchen and beyond? ShopRite Registered Dietitians have partnered with RWJ Barnabas Health to bring you Hands on Healthy Kids! This free 6-part series, held at ShopRite stores, is open to kids ages 7-10 and was created to inspire young children to learn about nutrition topics and be inspired to eat healthier. Both educational and fun, this interactive program teaches kids how to create simple, tasty recipes while discovering the nutritional benefits of different food groups. Culinary goodies, recipes, and fun giveaways are provided at each class. To enroll your child in their award-winning Hands on Healthy Kids series, stop by the office of your local ShopRite Dietitian, or click here to find a class near you. CHEF IT UP is a great place to host your next cooking party event or attend some super cool cooking classes! 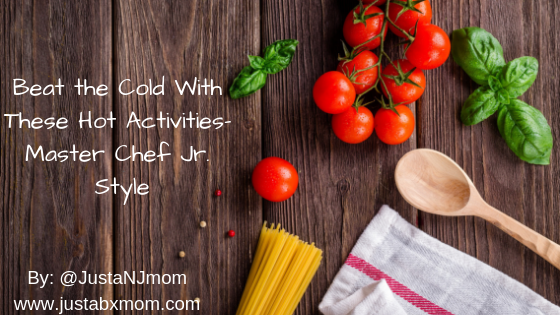 And CHEF IT UP 2 GO are the travel teams that bring all the fun to you with at home cooking parties; interactive events & awesomely cool enrichment and after school programs! Both Chef It Up & Chef It Up 2 Go are completely nut free and very food allergy friendly! They have franchises in NJ; FL; CA; TX & growing!! They have something for everyone age from 2 1/2 to 102! Over the last 12 years, they have designed and honed their children’s cooking classes to make them fun and educational. Offering classes for children from the ages of 3 and up. Many of these classes are made up of 6 weekly 1-hour sessions. All of the kids cooking classes are hands-on events. The children are able to prepare, cook and eat their creations during the class. Perfect for kids 8-13, you’ll learn to make, delicious recipes, from main courses to desserts and snacks, with plenty of tasting along the way. So bring your chef-in-training to Williams Sonoma for Junior Chef Classes, which take place on sporadic Saturday mornings throughout the month. While parents do a little shopping in the store, kids will learn to whip up tasty dishes with different themes. Classic Thyme’s new “Cooking with the Kids” cooking class party is designed to have parents join in the fun of creating culinary memories with their children. Parents bond with their children and other parents while cooking together and enjoying the results of their activities. Select from our wide variety of class options and our experienced culinary staff will prepare, organize, and lead the party. “Cooking with the Kids” private cooking class parties are ideal for birthday parties, family celebrations, kids clubs and, playgroups. Now when the little one becomes an Iron Chef mini, don’t forget to give me a shoutout so that we can all enjoy the fruits of this labor! It sounds like one of these would be perfect to give her a real look into her future! LOL.